Here it is! The long-awaited, official Web Site of The DIRDY BIRDIES Jug Band. This is a group of wandering minstrels that�s been together since 1965, and this site is the place to find out everything (well, just about everything) about us, The Officially-Sanctioned, Guiness Book of Records, Jug Band for the Millennium! TRACKS! - The Birdies offer their 2nd studio CD! 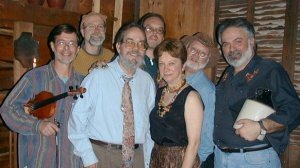 The Carrboro Chronicles - Jack's Fourth of July trip to North Carolina to record with Mother Vinyard's Jug Band. Complete with Pix. Geoff Muldaur and The Dirdy Birdies! Another earthshaking moment in the History of The Jug Band for The Millennium. The next installment of The Big Break story: a fan from yesteryear chips in with memories! 'Jugs Across the Sea' The video documentary of The 1987 Tour! New Funstuff! Buy The Video!